Promoted natural relief. 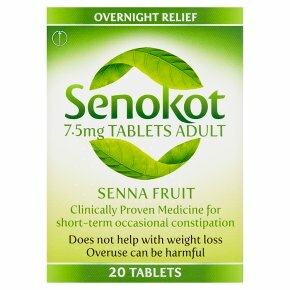 Gentle effective constipation relief.Senokot is a reliably effective laxative made with natural senna treated especially to yielda constant amount of active ingredient in each dose, to give predictable relief from occasional or non-persistent constipation. How to Take Senokot Tablets: Senokot is to be taken by mouth only. Adults and children over 12 years: take 2 tablets at night. (do not take more than 2 tablets in any 24hr period). Children 6 years and over: consult your doctor. Not recommended for children under 6 years. Senokot usually acts within 8-12 hours. Dose can be repeated on a daily basis until bowel action is restored. BEFORE TAKING THIS MEDICINE:<br>Do not take if:<br>Your abdomen is tender to the touch or hurts when you move<br>You have sharp or persistent stomach pain<br>Consult your doctor if:<br>If there is no bowel movement within 3 days of use<br>Laxatives are needed every day, or abdominal pain persists<br>You accidentally take too many tablets<br>If you have been told that you have an intolerance to some sugar, as each tablet contains 15.82mg lactose<br><br>SIDE EFFECTS<br>You may experience temporary mild stomach pains. If you have these or any other symptoms after taking this product, tell your doctor or pharmacist.<br><br>Keep out of reach and sight of children.